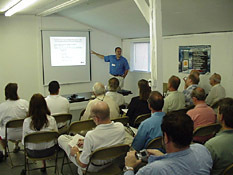 HED International, Inc., a leader in the engineering and manufacture of advanced thermal process systems hosted the annual Ceramic Association of New Jersey (CANJ) summer meeting at its Ringoes, New Jersey headquarters. The CANJ meeting featured a technical session with presentations by Dr. Richard Haber, professor of ceramic engineering at Rutgers University and Bob Horvath, M.S. Materials Science Engineering, Rutgers and the Manager of Manufacturing Operations at HED. In the afternoon, attendees participated in a golf outing at neighboring Heron Glen golf links followed by a buffet dinner and awards presentation. “We are proud to host the summer meeting of the CANJ for the second year in a row. It is a great forum for people to meet their colleagues in the materials industry in New Jersey and surrounding areas.” – Jim Dennis, President HED International, Inc.